Eat healthy for life. It is a good you owe yourself, whether you are obese or not. How do i eat healthy? We bring you evidence based tips on how to eat healthy now and for life. The World Health Organization defines malnutrition as "when a person is not getting enough food or not getting the right sort of food" - Italics ours. It went ahead to report that over 800 million persons are in danger of dying from excesses in eating every year, and that 58% of all deaths from all causes are due to poor eating! It continues "Malnutrition is the largest single contributor to disease". Yes. Indulging in unhealthy eating habit courts death. Eat healthy and reduce your susceptibility to chronic illnesses like obesity, type two diabetes, metabolic syndrome, heart attacks, hypertension, liver cirrhosis, and various types of cancers! But how do I eat healthy, some have asked, wondering if they can afford the cost involve. No. Eating healthy does not need to be expensive. It does not also mean you stop enjoying "the good things of life", confined to a string of boring dietary straight jacket. Whether rich or not so rich, and wherever you live, you can eat very well and eat healthy for life. The trick is understanding what constitutes a balanced healthy diet and work your way with available food items to building your own diet and menu list. You will also need to know what to avoid in meals. 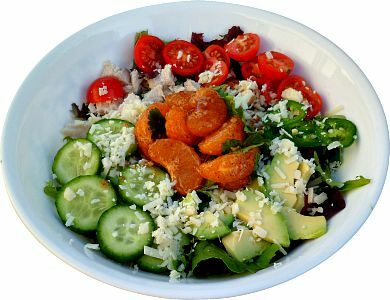 The very first tip to eating well is to understand the types and classes of food, in terms of their nutritional value. A knowledge of this is vital to help prevent eating only one "food type" to the detriment of our health. These are mainly derived from cereals like rice, millet, oat, barley, rye, wheat (including bread), maize, pasta, and other food items like plantain, cocoyam, yams, potato, cassava (and cassava products like tapioca, gari, fufu, ga kenkey, starch, akpu) and more. These include fresh fruits, legumes like beans, soy, lentils, chick peas, cow peas, nuts and dried fruits, vegetables like broccoli, carrots, salads, spinach, spring greens, and more. This group of food includes things like puddings, desserts, ice creams, chocolate bars, toffees, cakes in general, sweets, and similar food items. Dr. Hector Bourges, Director of Nutrition at the National Institute of Medical Science and Nutrition in Mexico City, a well respected nutritionist, and an expert with the not-for-profit organization, Danone International Institute for Nutritional Health, advices that an healthy diet must be balanced, sufficient and complete, with portions mainly from foods in group one, two and three, and very small portions from foods in group four and five (sparingly). Cut down on saturated and trans fat, as these remarkably increases your risk of heart disease. It means reduce your intake of hard cheese, trim off fat from meat as much as possible before cooking, remove the skin off chicken to reduce fat, cut down on biscuits (they contain loads of fat!). Instead of frying, why not bake, grill or boil? Doing so helps reduce your fat intake. If you can, try eating mostly plants in your meals. A vegetable based meal is healthier than meat based meal, provided you have meat alternatives regularly, like legumes - beans and pulses, along with your fruit and vegetable. Drink plenty of water a day. At least 2 to 6 liters a day and cut down on sweetened drinks. Taking a bottle of fizzy drink a day will increase your weight by 6.8kg in a year, as well as contribute to your developing the metabolic syndrome and type two diabetes. Cut down on salts in your meals too. Use more natural spices to reduce the need to add salt to food. Try never to add salt to food once served on the table. To eat healthy for life also means not eating too big a portion of food at any time. Small regular meals do your body good than large meals. Yes. These are simple but proven ways on how to eat well and eat healthy for life. How many times have you heard the phrase, "Eat healthy for life"? It's everywhere. No matter where you go, you see reminders to eat healthy. America leads the world in the rapid growth of obesity, in all age groups. Other nations are not growing at the same alarming rate as the US. One of the major contributing factors in those other countries is the lifestyle of the people. They get more daily exercise. On the other hand, we are very much a society of conveniences, believing that if we can reduce the number of steps to perform a given task it is better. For instance, everyone tries to find the closest parking spot to the front door of the grocery store. I, too, am guilty of this one. Develop A Healthy Eating Habit In 30 Days! To eat healthy for life will require a lifestyle change regarding what you choose to put in your mouth. Doing something for 30 days makes it a habit! Write a food journal for 7 days, listing every thing you put in your mouth. Find out the amount of calories and fat each item you eat contains. Categorize the food into the food group it belongs as shown above. See what percentage of what food you are eating. The results will shock you! It doesn't matter if it is a bad habit or a good habit. When done for about 30 days it becomes a HABIT. So, using the brilliant mind we all think we have, it stands to reason that a bad eating habit can be changed to a healthy eating habit in about 30 days. Here is a chart listing, in simple terms, what you should consume each day if you want to eat healthy for life. I challenge you to eat strictly as this chart instructs for only 30 days. It will change your life. 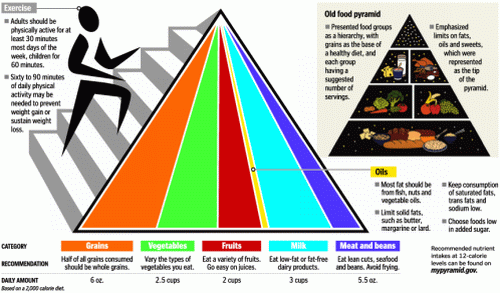 Follow the food pyramid and apply the practical tips on how to eat well presented here. Have you been called a "couch potato"? If you have, you should understand that you have been insulted and do something about it. Get off the couch and do something. The modern technology of the remote has even eliminated our having to get up to change the TV channel. Eat Healthy For Life: Have Your Say! Have you been trying to eat healthy to control your weight or just for a healthy lifestyle? Any obstacle? Any success? Want to share your experience? Or just a quick question on your mind on specific ways to apply the healthy eating tips here. Have your say. Leave your comments or questions here!